Middle belt rave of the moment "MV" premiers his 2nd official single and the first for the year 2019, a dancehall feel song titled "Dirty Wine". The song the streets has been anticipated for some time since pictures from the studio session leaked. In his quest to deliver quality music to his fast growing fanbase, "MV" teams up with the best rappers the game has seen in this part of the world - Self acclaimed best rapper alive "JTwarrior" and president of the rap game "EMS" sure did justice on the potential hit single. 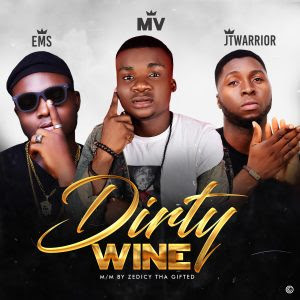 "Dirty Wine" which sees three kings of the game served hot as mixed and mastered by "Zedicy" Tha Mix Alien.